See your garage storage potential. 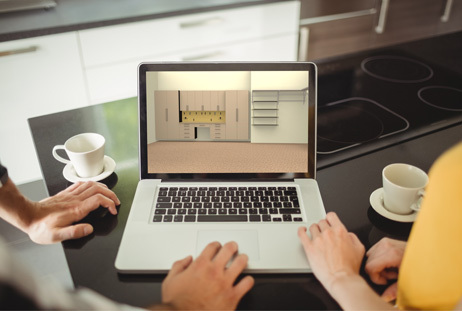 With our 3D Design Software, you can see what your project will actually look like once completed. Our trained technicians will draw your garage into our software with all unique features and wall elevations to give you the most accurate projection. With our help, you can completely transform your cluttered garage into the organized space you've always wanted. Click here to view sample garage renderings from some of our past projects. We will send your drawing and complete estimate of costs to your email for you to review. This drawing will reflect your garage interior with your selected products installed to give you a detailed idea of what your garage could look like once we're done with it. If you need us to change anything about your rendering, we are happy to do just that! We will make the changes quickly so your garage transformation can start quickly! After you approved your design and estimate, we will get your installation scheduled and will start moving forward on your garage storage makeover!